So imagine my joy when I was given the opportunity to hand-pick some platters and little bowls from Denby's Natural Canvas Collection to make entertaining extra classy. I went for the rectangual platter, the oval tray, the cute little dipping bowls and the Natural Canvas Placemats. As the pieces are super easy to mix and match, I did just that with a few of my own ceramics and TADA the perfect snack table was set. The Denby Pottery pieces came in super handy from the outset as I had a food blogger friend stop by meaning I had the perfect excuse to make and serve her these raw peanutbutter energy balls on my adorable little platters. You can see the end result in today's blog post images :). I feel that the energy balls looked extra delicious on the Denby Pottery and I could have sworn they tasted even better than normal ;). And after all was eaten and the day ended, my man grabbed the bowls and filled them with dips and other goodies to go with our dinner that evening. With over 200 years of pottery making behind them, Denby are bound to have a collection with your name on it! You can see all their gorgeous pottery by clicking here and the collection I went gaga over by clicking here. AND the best part you can win their takeaway pottery set from the Natural Canvas collection. Read on to find out how! THIS COMPETITION IS NOW CLOSED! All you need to do for a chance to win is tell me: How do you get through the cold, dark winter days? Please be quick with your answers, entry to this giveaway closes at midnight (Greenwich Time) on Monday, February 5th, 2018. The winner will be picked and notified within a week of the closing date. CONGRATULATIONS MARION! YOU'E THE LUCKY WINNER! Please note that this competition is open to UK residents only. Therefore, I'd be super grateful if you can be clear when you comment whether you live in the UK or not. And even if you don't, please still feel free to share your tips and tricks. I'd love to hear them. Thank you for reading everyone and see you next week. 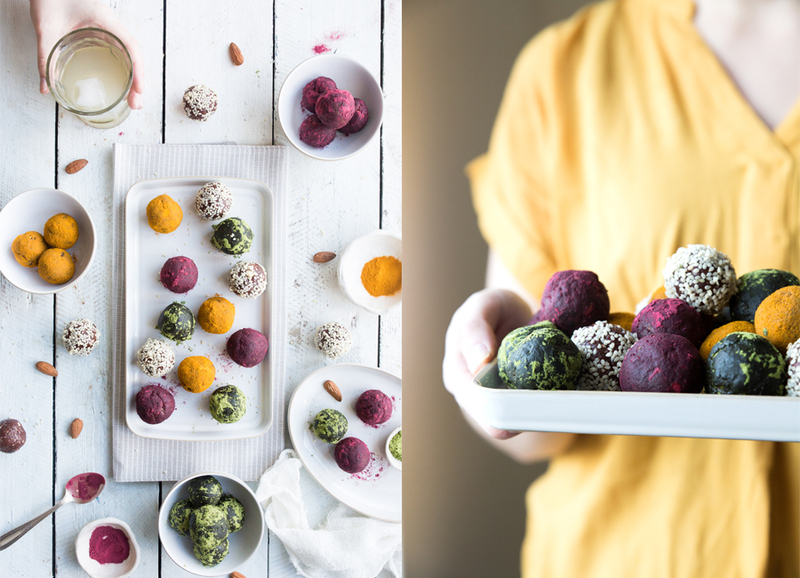 How on earth I went nearly four years without sharing a raw vegan energy ball recipe with you on my blog, is beyond me. But I'm glad to rectify that today and put things right! Having had my fair share of energy balls and bliss bites I can hands down say these are the best I've ever had. Moreover it's made with ingredients you can find in any supermarket. Enjoy! (Recipe adapted from Madeleine Shaw). Place all the ingredients in a food processor and blitz until combined. Create 14 bliss balls by taking about a tablespoon of the mixture in your hand and rolling it into a small ball. If you'd like to garnish the energy balls, have little dipping bowls ready with whichever powder/seeds you choose. Roll the ball in the powder/seeds and done! Tip 1: If you are making these in the summer, the balls might feel a bit gooey and sticky. Just pop the ready made energy balls in the fridge for 5 minutes and they should be easier to handle. Tip 2: I like to make this quantity and then freeze them in packs of 3. It means I have a little snack whenever the mood strikes me. Tip 3: Need other garnish ideas? How about a simple cacao powder or melted chocolate? the sky is the limit. Tip 4: Using turmeric to garnish? Do use with caution as it stains your fingers like crazy! Tip 5: To keep it raw and paleo friendly, consider using raw almond butter instead of peanutbutter. Shoudl taste just as lovely. P.S. Want to ensure you don't miss a recipe and hear about give-aways first? Then sign up to the mailing list below. I'd love to have you on board.